I’ve been a little under the weather this week, which is why some of my posts this week were a little crabby, and why I just didn’t even bother posting the last 2 days. Instead, I’ve been sewing. I showed off my page spread for my ABC RR in my previous post, but I thought I’d also show off the quilt top I finished yesterday. It’s based on the pattern StarStruck found at Bonnie Hunter’s website. You can click on the photo to view it larger. This is my 2nd StarStruck. It’s a fun pattern to put together — a good stashbuster. I do like how this turned out, but I think I like the green with red accents version that I did previously. I think there might be *too* much red in this one. It looks pretty wonky, but it’s just hanging on my design wall, it is actually straight…. Thanks to some antibiotics, I’m feeling much better, so hopefully I’ll be more productive and less crabby this week. I am very partial to red quilts – and I think that one looks wonderful. That pattern is really pretty! How will you quilt it? Glad yo are feeling better. I think Star Stuck #2 look great! I might have to give this one a try too. 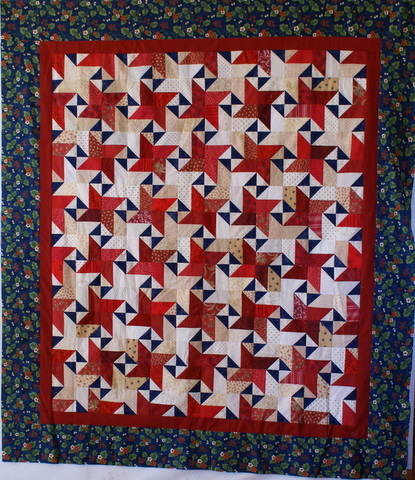 When you have a chance, take a look at the quilt photo in my April 13 blog entry. Hi Suzanne… feeling better today? ?